Since a while we are able to render a bottom tabbar in Xamarin Forms for Android! So recently we added this in our production app, because our own implementation was not always working 100% correct depending on the Android version it was being shown. But we also needed some extra functionality and didn’t want to bring in an external library. So let me show you what we needed and how we added this to Xamarin Forms Android. First extra needed feature was the ability to show tab badges. In other words a counter that shows, in our case, the amount of unread messages. Now the fact that we eventually also need to port this to iOS, means we need some abstracted elements that reside in Xamarin Forms project and not in the os specific projects. First we need a small class that can contain the badge info that we want to show, it has 2 properties, one for the badge caption and one for the badge color. So when you want to dynamically change the color or caption, you just change the data in the properties and the code on os level will handle this. Because we want to interact on os level, we need to create a Custom Renderer. To be sure it can get a hold of the TabData class we also create our own TabbedPage first. I pre-init this page with a badge for the first tab that is blue and has 5 as caption. With that in place we can start adding our Android Custom renderer. The actual end goal of the custom renderer is to inject a badge control in each tab where needed. So we have to go through the Tabs dictionary of the BottomTabbedPage to see if we need to add a badge or not. Also we want to hook into the PropertyChanged event of the BadgeData class, so that we can actually change the visuals while the app is running. This is all handled in the OnElementChanged method of the Custom Renderer. A bunch of code, but it’s not that difficult to understand… first we adjust the Shift Mode so that our tabs are always shown equally ( reference the blog post of James on top ). After that we go through the defined TabData elements and get the corresponding BottomNavigationItemView ( the actual item being rendered ). Note that in my example, I only have a badge on the first tab. When you want badges on each, you need to pre init the TabData list for each tab. When we want to add a badge, we create a new TextView element and add it to the corresponding BottomNavigationItemView. The TextView itself is just text but with a circular background element ShapeDrawable, that inherits the color you specified in the BadgeData. All this code can be seen in the BadgeView class. Also note that we keep track of the PropertyChanged event, so that we alter the color and caption if needed of the presented BadgeView. And that’s it for our first feature! Bottom tabs with badges for Android. But we also wanted to have the ability to show only icons on the tabs, so loosing the labels. This will of course only work when you have very descriptive icons. Now normally this should be very easy in Android API 28, because there you can provide a value stating if you want labels or not… but since of this writing Xamarin Forms is not yet 28 compatible ( https://github.com/xamarin/Xamarin.Forms/issues/3083 ) so we need our own implementation. For this to work, we will strip out the labels that are available in the TabView. But that is not enough, we also need to shift down the icon. Because when you loose the labels, the icon will not be in the center of the TabView. On our BottomTabbedPage class we already added a bool property Labels that we can set in XAML to indicate if we want tabs with or without labels. In the OnElementChanged we strip out the labels. And in the OnLayout we shift down the icons ( we only have the tab height at that point ). So we take the actual height of the tab itself, divided by 2 to get the center. Than we grab the height of the icon and also divide this by 2 and also get the current top position of the icon. With those values we now know how much pixels we need to add as top padding to our icon to get it vertically center. All in all not that much code, but as always with android, you need to know how the actual objects are called and rendered. Assume you have some news page that contains a header with the actual news title, some highlight image and a lot of body text. If this is represented on a mobile device, depending on the screen resolution, this can result in the user needing to scroll the text content to be able to read everything. Now if you just put the whole page in a ScrollView, the user will loose the content of the article he is reading, because most likely the title will also scroll out of view. So let me show you what you can do to keep the title fixed as soon as it reaches a certain anchor point on screen, while the user is scrolling the text content. You will notice the title “Bear found in the wild” is fixed to the bottom of the highlight picture and as soon as the user scrolls, this will also scroll to the top of the screen. But we want to keep it in view when it reaches the top of the image ( it will be fixed below the “Fixed header demo page title ). even if the user keeps scrolling down after we reached our anchor point. <Span Text="&#10;&#10;Bears are mammals of the family Ursidae. Bears are classified as caniforms, or doglike carnivorans, with the pinnipeds being their closest living relatives. Although only eight species of bears are extant, they are widespread, appearing in a wide variety of habitats throughout the Northern Hemisphere and partially in the Southern Hemisphere. Bears are found on the continents of North America, Central America, South America, Europe, and Asia. &#10;&#10;Common characteristics of modern bears include large bodies with stocky legs, long snouts, shaggy hair, plantigrade paws with five nonretractile claws, and short tails. While the polar bear is mostly carnivorous and the giant panda feeds almost entirely on bamboo, the remaining six species are omnivorous, with varied diets. &#10;&#10;With the exceptions of courting individuals and mothers with their young, bears are typically solitary animals. They are generally diurnal, but may be active during the night (nocturnal) or twilight (crepuscular), particularly around humans. Bears are aided by an excellent sense of smell, and despite their heavy build and awkward gait, they can run quickly and are adept climbers and swimmers. In autumn, some bear species forage large amounts of fermented fruits, which affects their behaviour. Bears use shelters, such as caves and burrows, as their dens; most species occupy their dens during the winter for a long period (up to 100 days) of sleep similar to hibernation. &#10;&#10;Bears have been hunted since prehistoric times for their meat and fur. With their tremendous physical presence and charisma, they play a prominent role in the arts, mythology, and other cultural aspects of various human societies. In modern times, the bears' existence has been pressured through the encroachment on their habitats and the illegal trade of bears and bear parts, including the Asian bile bear market. The IUCN lists six bear species as vulnerable or endangered, and even least concern species, such as the brown bear, are at risk of extirpation in certain countries. The poaching and international trade of these most threatened populations are prohibited, but still ongoing." 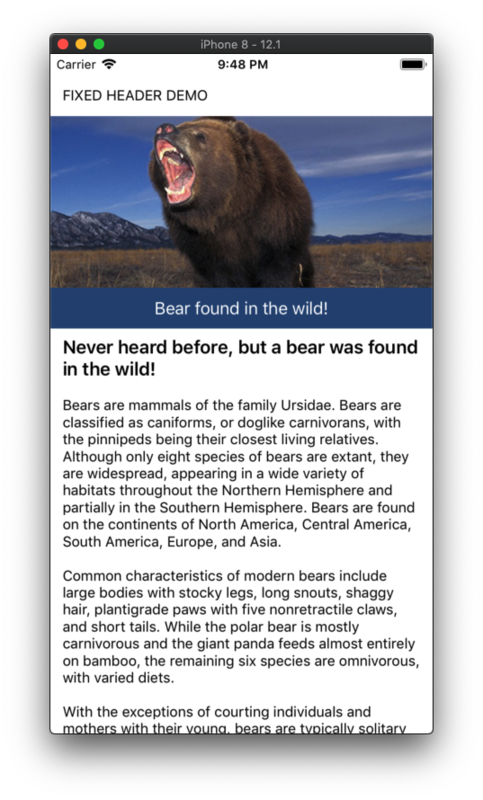 Text="Bear found in the wild!" Import thing to note here, is that the actual TitleText label is positioned outside of the ScrollView! This is needed, because we will animate it ourselves depending on the scroll values of the ScrollView. So how do we position this TitleText to the bottom of the bear image? This is done in the code behind of the page! In the constructor we hookup to the SizeChanged event of the bear image and in that event we will set the margin of the TitleText to the Height of the bear image minus the height of the TitleText itself. Now when the TitleText has been fixed to it’s starting position, we need to take hold of the top Y coördinate. This is needed to calculate the anchor point while scrolling. We also hookup to the SizeChanged event of the TitleText and when it changes, we can grab the Y point. Only one thing left to do, we now have to keep hold of the scroll values of the ScrollView, so we can animate the TitleText in sync with the scroll position and direction. So we subscribe to the PropertyChanged event of the ScrollView and look for Y value changes. When we get a change, we validate if it is still lower than our anchor point, if so, animate the TitleText Y coördinate to the same value. If it’s passed the anchor point, we will just keep the TitleText coördinate the same. This will result in the title being kept in view! Just a small reminder for myself. I was actually unaware this was possible in XAML styling, but now that I know it can be done, I will be using this more often 🙂 ! But what do you do when your custom font has no build in Bold feature and you have to rely on a separate custom font for that? Well, you can let your XAML style check for a trigger and swap the font! And now each time you add the FontAttributes=”Bold” property to your Label control, it will use the correct font type!